Renovating your kitchen can be a hugely rewarding undertaking. Whilst there may be challenges to overcome along the way, seeing the difference in your ‘Before and After’ photos makes the process all the more worthwhile. It’s a great visual reminder of how improving this space also impacts your daily lifestyle for the better. In our new series of Freedom Kitchens Before and Afters, we’ll be showcasing some real customers’ kitchens and laundries, featuring various sizes and styles around the country. Each has its own set of ‘before’ problems, and a brief given to Freedom Kitchens to deliver a design solution that suits their individual needs. 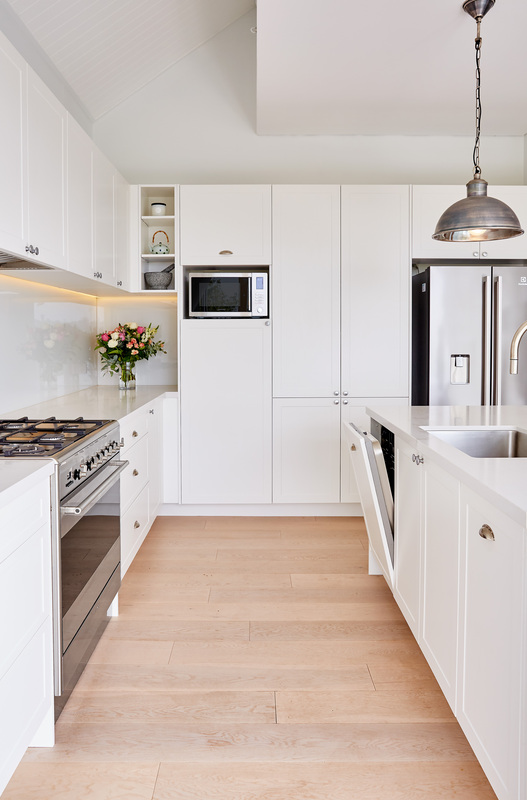 Read on to see how we transformed this kitchen and laundry in Drummoyne for the Scotcher family. This home in the waterside Sydney suburb of Drummoyne had an older kitchen that was feeling outdated, with tired cabinetry, small drawers and no dedicated pantry storage. The small, narrow U-shape layout was closed in and lacked room for the family to use it together as a multi-purpose space. The laundry was also old, in a separate small room with minimal cabinet space. The Scotcher’s brief to Freedom Kitchens was to upsize everything: create a spacious kitchen with large, soft close drawers, plenty of cabinets and pantry storage, plus an island bench. 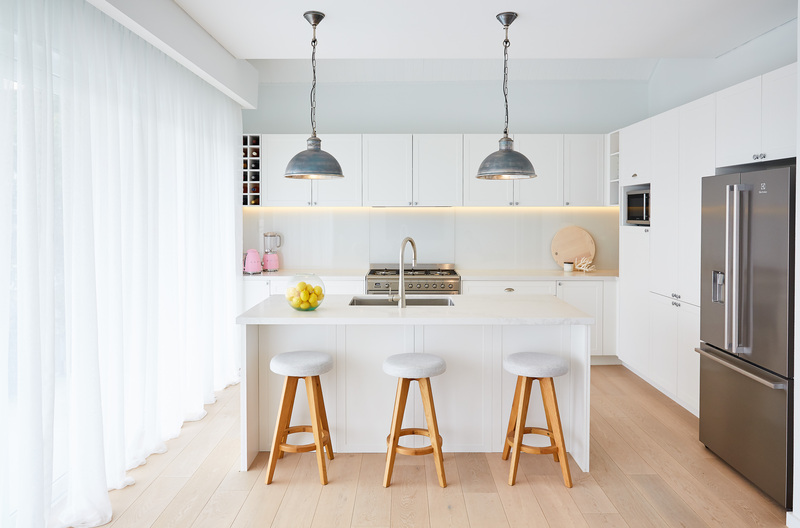 They liked the idea of a white, coastal inspired kitchen with Hamptons details to suit the rest of their home, and a beautiful Caesarstone benchtop. For their laundry, this customer wanted a fresh laundry with new appliances and plenty of space for brooms and an ironing board. And, understandably, they wanted the style and finishes to match their new kitchen. The new kitchen design has doubled their kitchen space by moving the right wall out, and revising the layout to an L-shape with an island benchtop in the middle of the room. 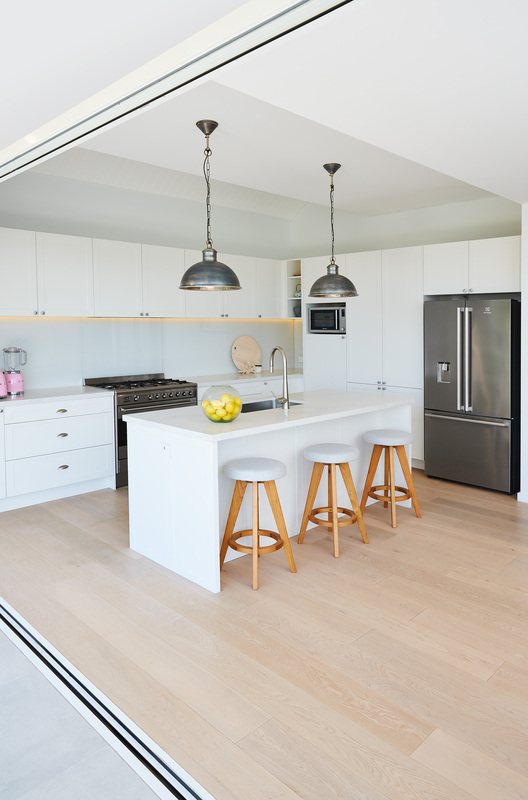 Their kitchen has also been elevated into a modern indoor/outdoor entertaining space by replacing the left wall with glass folding doors, allowing them to completely open up the kitchen to the backyard. The heart of their home has been made so much more enjoyable now that it has plenty of natural light and is connected to the outdoors. 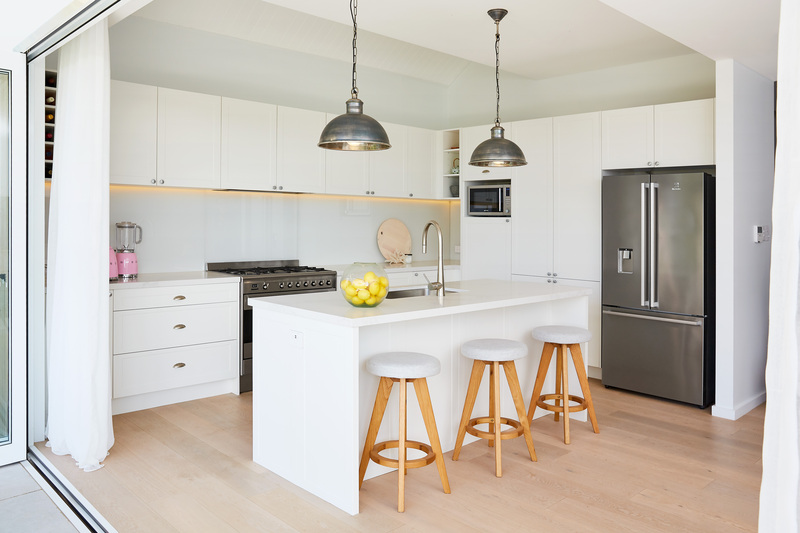 The Shaker-style Sierra door profile in White Matt for the cabinetry was the perfect option for a Hamptons look, complete with classic Satin Cup handles on lower cabinets and Dimple Knob handles on the overheads. The overhead cabinets were also fitted with LED task lighting underneath, perfect for illuminating the rear bench. The cabinetry hides an integrated dishwasher, while their new french door fridge remains on show. The gleam of its stainless steel is matched by their new warehouse style pendants, highlighting the island benchtop. 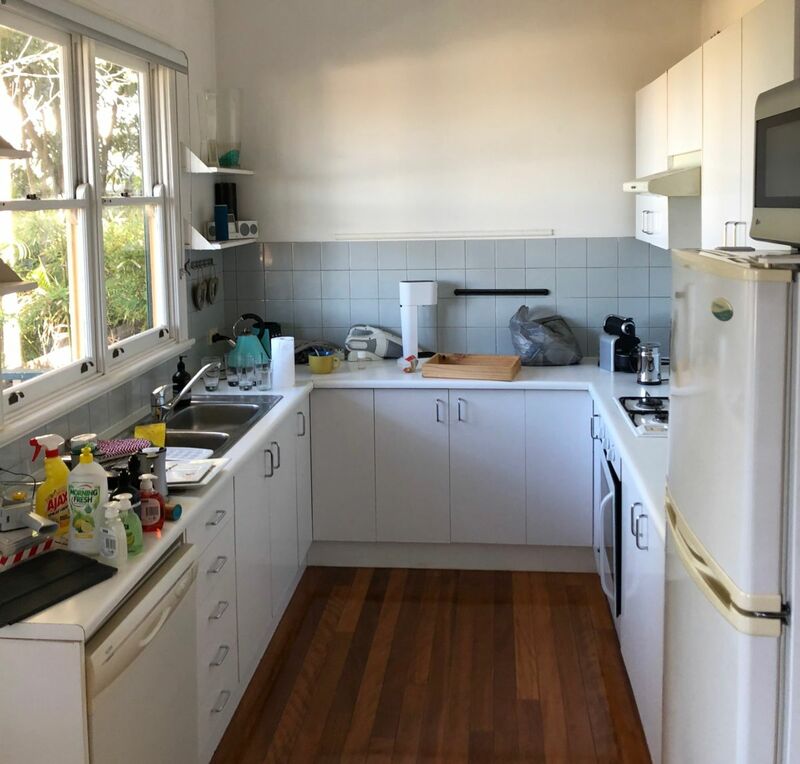 The benchtop is now the centrepiece of the kitchen, serving not only as a prep and clean-up station complete with sink and gooseneck tap, but also a modern breakfast bench and work/study station. 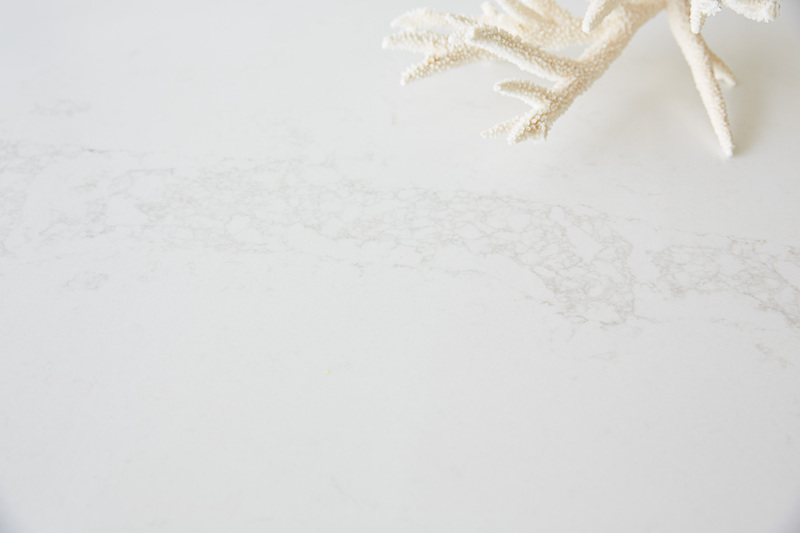 Caesarstone Calacatta Nuvo was chosen for its subtle beauty with marble-like veining, and used on both the island bench and the rear benchtop. So what to do the Scotcher family think of their kitchen makeover? Watch what our happy customer had to say about designing their new kitchen with Freedom Kitchens. In keeping with the style of their new kitchen, the Scotcher’s new laundry is equally beautiful and utilizes the same Sierra cabinetry in fresh White Matt, creating a sense of cohesion between their rooms. 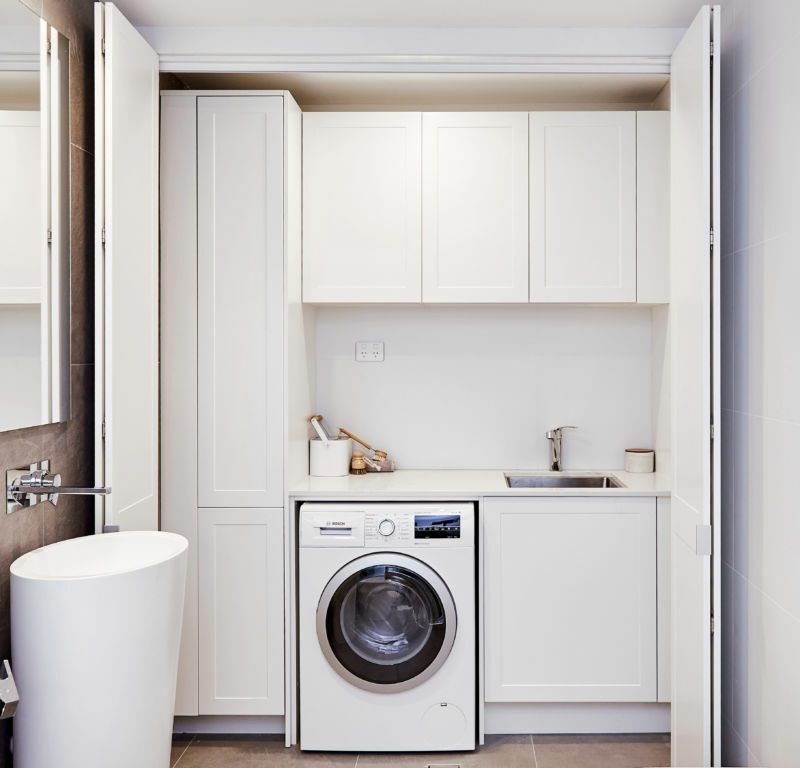 Maximizing the space within this combined bathroom and laundry, the new design includes a utility sink, with a washer/dryer underneath a Caesarstone work bench, and inclusion of a tall broom cabinet for brooms and the ironing board. 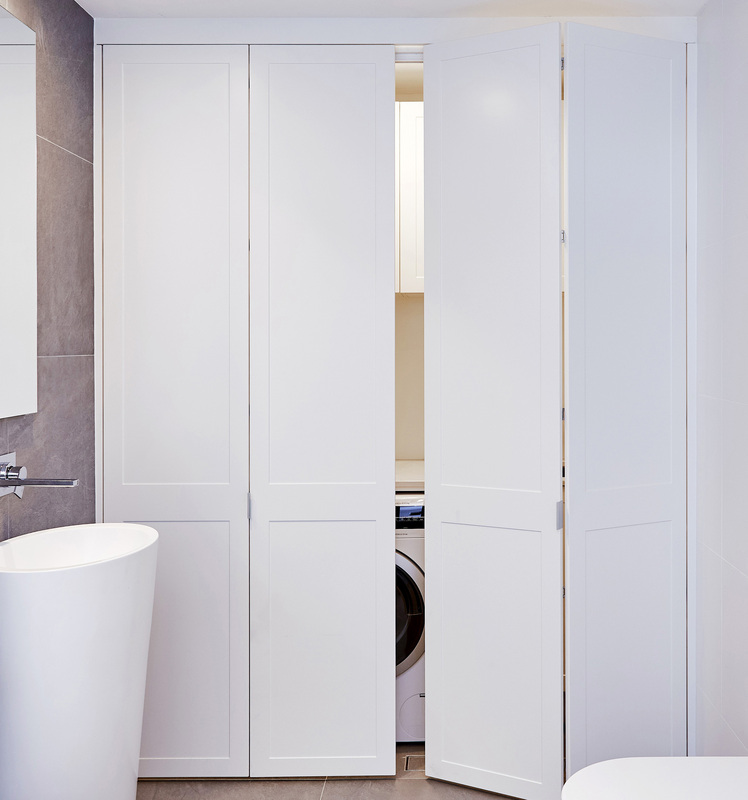 The overhead cabinets provide ample storage space for their laundry products, as well as their towels. 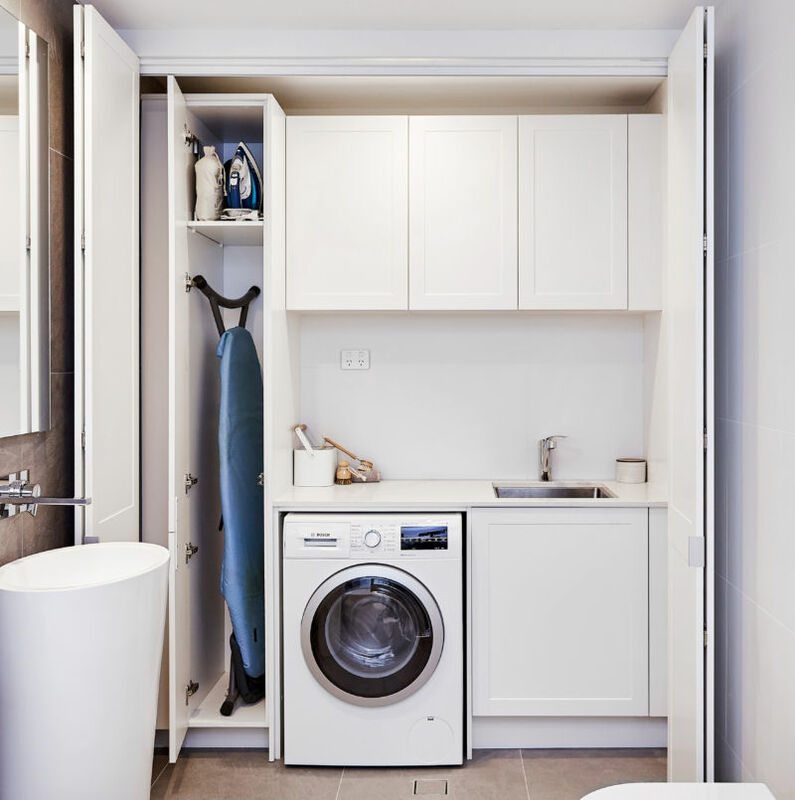 One of the best features is that all of this can be concealed behind folding hinged cabinet doors – making it hard to tell that this neat little space is a laundry within a bathroom! Here’s what the Scotchers had to say about their laundry transformation with Freedom Kitchens. Is it time to see how your own kitchen can be transformed by a Freedom Kitchens make-over? Why wait – start your kitchen journey today by booking a free design appointment to have a designer out to your own home.